It's funny that in the months where I want to wear the least makeup is the time that I fall in love with the most new products and find myself wanting to test lots of different things out. But there are those products that are super dependable that I find myself reaching for when it's too hot or I'm too sweaty. 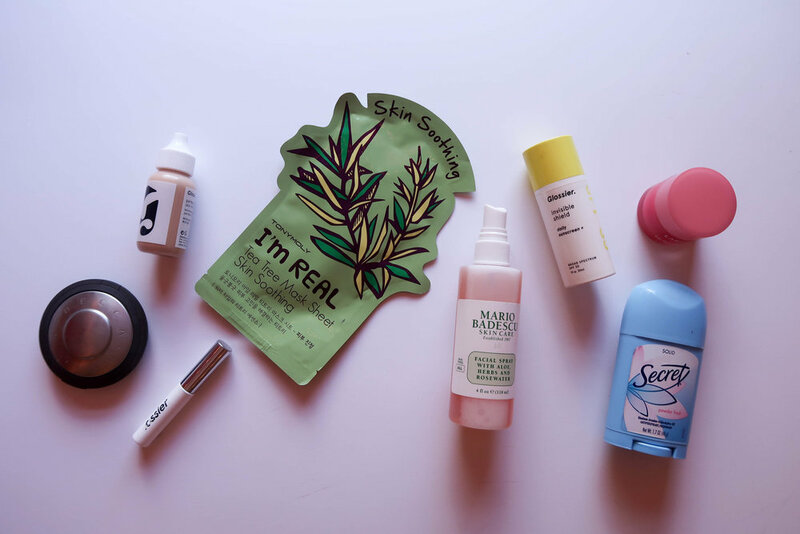 Introducing all of my summer beauty favorites that make my skin stay happy through the humidity and the heat, that restore hydration when needed, and that also all happen to have super cute packaging. From masks, to sunscreen, to mists, these are the products that make my summer skin feel the best it can be. Don't forget to enter the Nordstrom gift card giveaway at the bottom of this post! No one wants to wear foundation in this heat, and Glossier has found the perfect solution. This is an ultra-thin formula designed to just be a thin layer on top of your skin. If you're all about that dewy, glowy look in the summer months, you're going to want to pick up an awesome highlighter. We all know I love this one from Becca Cosmetics, because it adds perfect shimmer to any look. In this NYC heat, if you draw on your brows you could be in true danger of sweating them off in the humidity. Opt for a brow gel that feels light but holds the shape of your brows. If you want to hit refresh on your makeup mid-afternoon I highly suggest keeping a bottle of this on your desk. This mist contains aloe, herbs and rosewater and feels and smells amazing, and it's only $7! SPF should be worn year-round but in the summer months take extra care with your skin. This is my all-time favorite face sunscreen because it's not sticky and it comes out clear and dries quickly. Do we really need to get into why I need deodorant in the summertime? Ok, great. I don't know about you all but my lips are super sensitive and can get cracked and burned and dry and all kinds of things in the heat. This helps repair them and it happens overnight so you don't have to do much other than put it on.